if you follow me on instagram, this little love shout-out should come as no surprise. I’ve failed so far in my attempts to make spring come faster to cold and blustery Chicago, but that didn’t stop me from painting my nails in cheery spring hues. I’m currently sporting the orange shade from essie’s resort collection, and it’s the perfect shade of cantaloupe, immediately making you think of melons and warm weather without venturing into neon territory. it’s actually a very soft color, and I’m loving how it provides such a quiet pop of color against all the blacks and greys of my wardrobe. 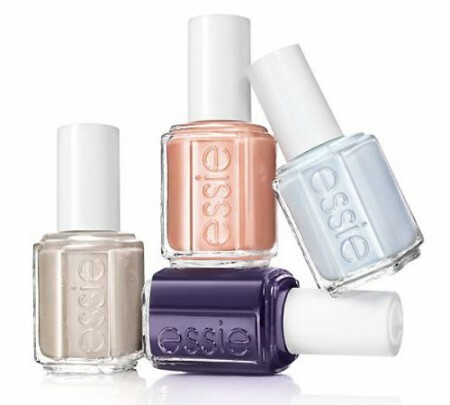 save for the deep purple shade, all of these colors are quite pastel-y, which are usually a nightmare against my tan skin, but these actually look really nice on, including the lovely beige. if I had to choose, I would say essie is my favorite brand of nail polish, and this collection definitely made me happy around these parts. I picked up the 4-pack of minis, which is a nice option for when you can’t choose just one.